Welcome to the Okavango Delta safari tour to Botswana. visit various attractions, know how to get there, where to stay, what to eat and so much more. You are transferred from Maun Airport to our Botswana safari tours offices where you will be requested to complete paper signing and documents before receiving a brief knowledge regarding overland vehicles. It is necessary to have shopped before departing to the campsites in Kazinkinii North of buffalo fence towards the edge of the Okavango Delta. On this day, travelers are driven off to Moremi Wild Reserve in the North Eastern corner of the Delta, which covers 1,000 Sq. Kmof grassy flood plains, where the day is spent viewing the game and a number of birds found in this area. There is a wide variety of wildlife and vegetation found in Moremi terrain. Then from here, we move to a private campsite, where we camp for 3 nights, in the middle of a wild bush around. On Thursday, we use a boat to explore deep into the Delta throughout the night using qualified guides at our camp, including the area around the Xananaka and the Third Bridge in the Okavango Delta. In the Okavango Delta, we explore the Third bridge and Xananaka in the Moremi area over the night. After taking heavy breakfast, we move to the Northern direction of Mabebe Depression, then after to Chobe National Park. 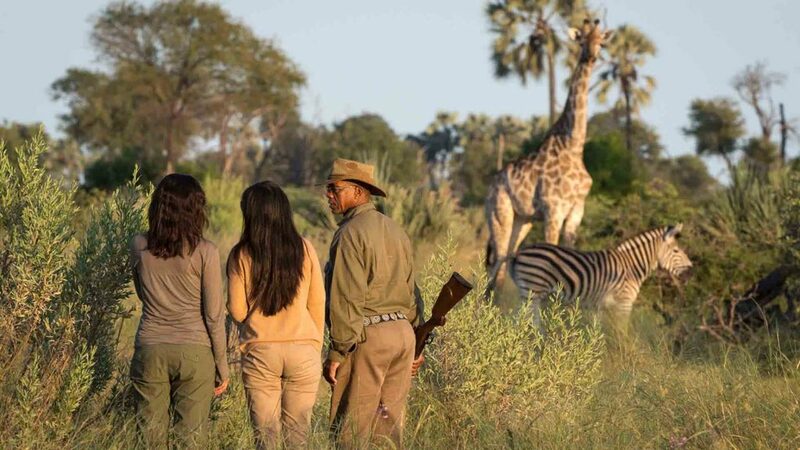 Botswana’s 2nd largest National Park which is divided into Chobe River, Savuti Marsh 50 Km North swamps in North West we enter Chobe National Park at Mababe gate and we depart to the Savuti game viewing places. We explore all the areas around Chobe National Park including Chobe River. Here we travel further in the North of Chobe Forest Reserve deep sand to Ngoma, then head to the east into Zimbabwe and Victoria Falls. For the next 2 nights, accommodation is available at a lodge in town, to have an option to visit the natural falls. There are many activities done here for one’s leisure, such as bungi jumping, river cruises on River Zambezi, helicopter flips, canoe safaris and white water rafting as well. Here we head back into Botswana for a 50-minute drive to the campsite. Then a trip will be arranged to explore river Chobe in the afternoon, to have the true African nature of game viewing and vegetation around Chobe River. We cross to Namibia after breakfast at Ngoma. Here we travel through Gaprivi National park. In this place, we visit the surrounding area and falls, then we make a camp at Popa Falls. We head to Shakawe in Botswana after a short drive. Here we have some rest on a boat trip on a delta’s handle pan, then camp in Dotsky at night. Here we explore world heritage site of Tsodllo Hills using the base of our camp in Drotsky. Here we can view paintings of Bushmen using a guided tour, which paintings were made a thousand years ago, showing a French culture and heritage. We head to Guma Lagoon and a boat can transfer us to our island camp, where we shall base for 2 days. Here one can have rides and have walks, Mozambique safari tours and holidays,. At this delta, one can enjoy game viewing, game walks, Mokoro rides and bird viewing while at leisure. Here visitors return to their mainland with their luggage. It is the last day of travel with us until you are transferred to the Airport.